I drew this yesterday but by the time I'd finished it I was so tired I didn't have any energy left to scan it in! SO here I am, bright and early this morning, posting it finally. 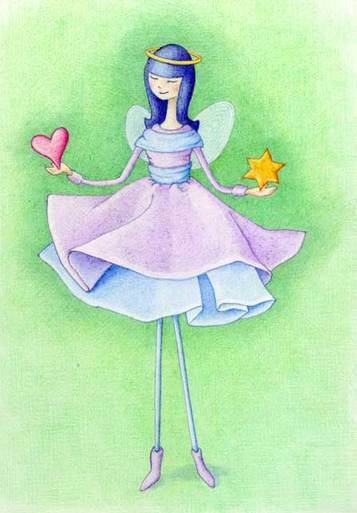 I bought a gorgeous angel ornament two days ago and liked it so much that it was the inspiration for this drawing although I changed the colours and the expression on her face, and added the heart and the star :). She was still the model who posed for it, so I must give her the credit due for inspiring me. It was also wonderful to be able to pick up a pencil and draw again -- am going to have to fit as much drawing as I can into my upcoming very busy schedule.